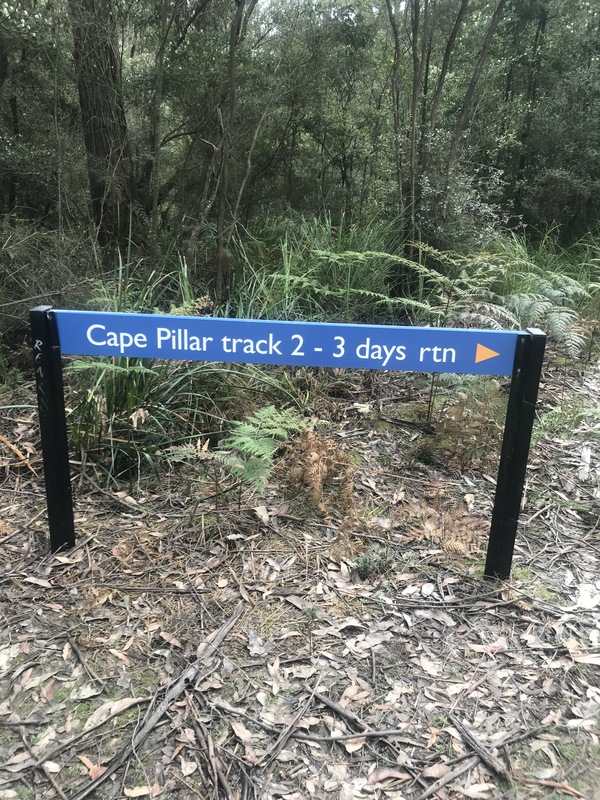 Cape Pillar in a day – Pewts. Since I arrived in Australia I’ve been buzzing for a running adventure. I felt the urge in London. Waking after a large Saturday, a headache from countless ales and the faint taste of the garlic mayo from the late night cheesy chips; getting the impulse to jump in the car and drive south until I hit the North Downs, then chasing trails & bridlepaths aimlessly getting lost in the rain, yet finding a sense of freedom that no suburban street or maintained parkland can ever give you. Tasmania appeals to me, geographically its separated from the rest of Australia. It’s wild, a city set amongst the sea and mountains (I say city, it has a population not much bigger than Swindon) but people are relaxed, the food is excellent and they have a love of live folk music – my kind of place. Having flown over from Melbourne, I was joined by my friend Jess, who claims she isn’t a runner, but somehow knocks out km’s without breaking a sweat. We got a hire car and a grubby hostel and prepared for a couple of days of hitting the trails. Day 1 was a bit of a test run, a 14km out and back to Wellington Falls, a remote waterfall that entailed climbing a defrosted glacier, stunning views and encountering a large black snake on the descent which as a sheltered Englishman scared the living daylights out of me. Tasmania in November is unpredictable, you are just as likely to get snowfall on the mountain as sunstroke on the coast. The test run gave us a better understanding of what to pack. Trail shoes, compression tights, tee’s, a hoody and wind breaker/rain jacket. In the bag, gels, nuts, fruit loaf, pitta & dips (personal favourite) power pack, headtorch, spare tee, vaseline, sunscreen, zinc and thermal top. We set off from Hobart at 6am. Keep cups full of McDonalds’ coffee (the only place serving) for a 2 hour drive to Fortescue Bay, the head of the Cape Pillar trail a 40km loop that takes in some of the highest cliff faces and sea views in the Southern Hemisphere. Having researched this trail, the local government had invested millions in creating a 4 day tourist hiking experience at a cost of $500 per person, fully equipped with three campsites of log cabins, hot water and bathroom facilities, but at the expense of free places to pitch a tent. A very clever way to make such a beautiful part of the world accessible (and profitable) but having read a few rogue blogs, it seemed manageable in a day. The only cost being $30 each for a national parks pass. And a 10km of less-used pathways to access it. As we turned off the A4 onto the C road, the tarmac fading to the red sand gravel roads with wild wallabies roaming free amongst the eucalyptus trees. It created the type of stereotypical picture postcard scene you associate Australia with. After following this road at a painfully slow pace (for fear of ruining the hire car) we arrived at a campsite and rangers office. After signing in our details with a promise of a return later that same day. We checked our packs and headed off, immediately missing the turn for the start of the trail, before having to double back 400m. The benefit to gatecrashing a glamour hiking experience (gliking?!) is how well maintained the trails were. Wide wooden boardwalks with steps, splitting the dense forest. We also passed many of the 48 people that stay in cabin complexes each night. We started climbing up the west side of the cape, with views of the Tasman sea emerging either side. The desire to stop and take a photo soon wore off as we realised the views became more impressive the further we went. As we made it to the blade, 1000ft with sheer drops above the sea we stopped for lunch to take in the stunning surroundings. After a well deserved pitta (or three) we took in the 360 views over cape Huay and Tasman Island whilst watching pods of dolphins and humpback whales playing hundreds of feet below. It’s a pretty amazing site to see mammals like that so remote, playing care free – they looked like dots from the cliff edge but it felt more naturally engaging than any boat tour could offer. We then entered the final and most enjoyable section of the trail. a shallow, meandering descent from the mountain back to the bay with views over the sea below. 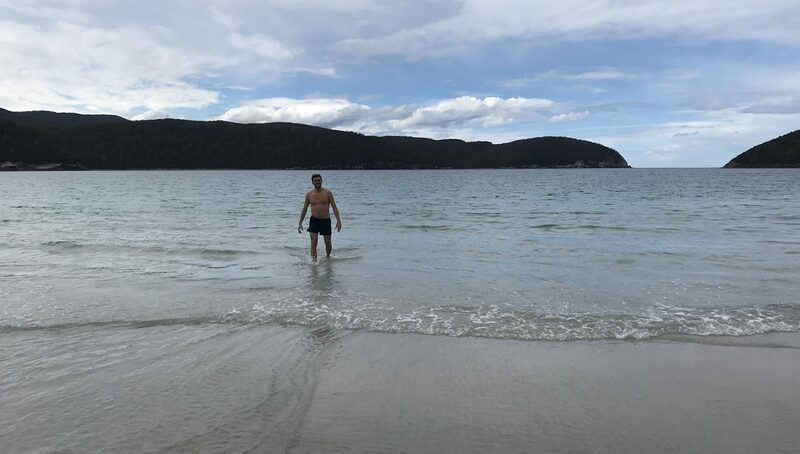 As we reached the beach, it seemed well deserved to take a quick dip. The icy water welcome to sore muscles. It’s definitely one of the best trails I’ve run. It was possibly a little much for one day for a walker but as a walk/run I would thoroughly recommend. 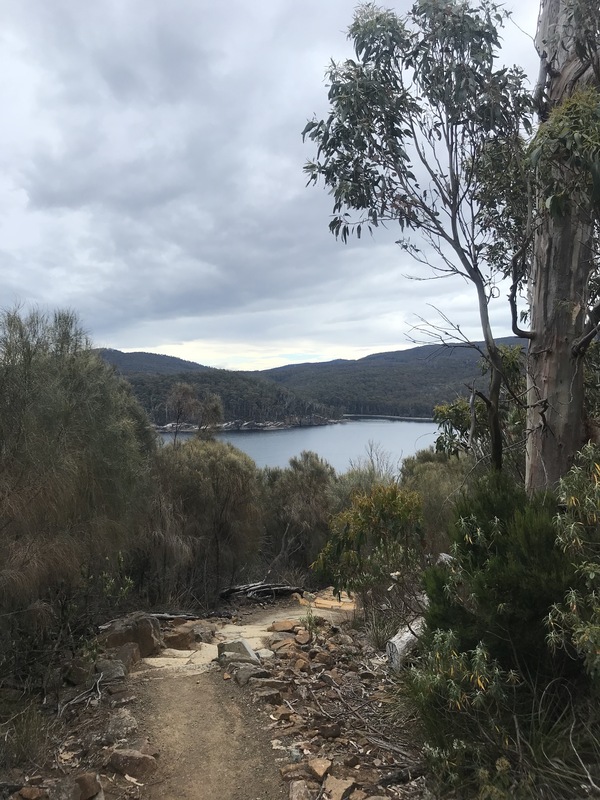 The ‘experience’ paid tour section did take a bit of the edge off remoteness of this south east tip of Tasmania, with boardwalks, bathrooms & running water. but it’s 2018 and if this venture encourages groups of people to head out into the wilderness, remove themselves from technology see true beauty for themselves in a safe way – I’m all for it. Tasmania as a country (its not a country, but feels so very different to the rest Australia) captured my imagination. I was incredibly fortunate to go for a few days – I could have stayed there weeks. To the tourist that ventures only to Hobart it may seem small and quiet. Dig deeper and there is a treasure trove of mountains, lakes and beaches. It made me reflect on being in England and my hungover drives out of London in search of nature. There are so many incredible parts to the UK, let alone Europe I feel I haven’t explored enough; The Moors, The Lakes, Dartmoor, Exmoor, The Peak District, The Chilterns. It might be an early new years resolution, but I feel 2019 might well have sparked a curiosity for adventures a little closer to home.